Ruika is a fifteen year old girl who possesses the power of Global Garden to grant wishes. Until now she has desperately tried to live as her younger brother Masato, who died in a plane crash years ago, for the sake of her mentally unstable mother who refuses to admit that it is Ruika who survived. Ruika's desire to please and protect her mother is so strong that it actually affected her physical development, so that her appearance remains androgynous. 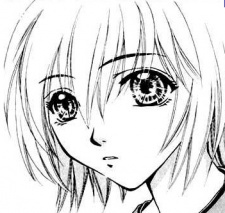 Later when she meets Hikaru and Robin, she starts to accept her existence as a girl and begins to change, shifting between her female and "male" form according to her emotional state. Ruika is also called by the names Verdandi - being the present form, Skuld - the future Ruika, also referred to as a goddess, and Uld.